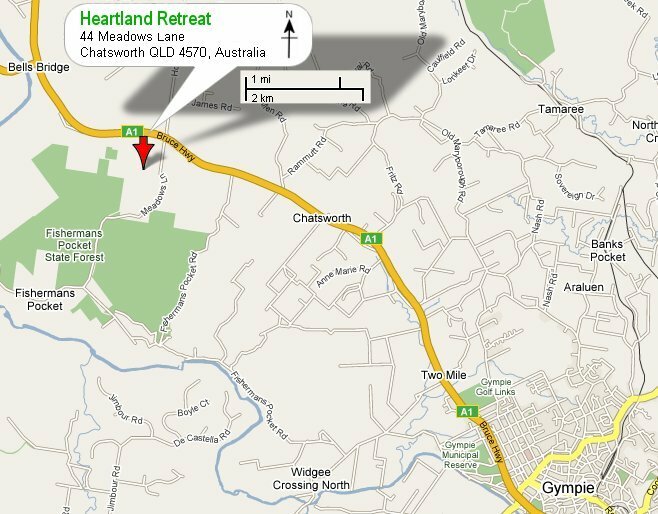 We’re located just 2 hours north of Brisbane, only 8 kilometres north of Gympie, just off the Bruce Highway (see map below). We recommend interstate guests (Sydney, Canberra, Melbourne and Adelaide) fly direct to Sunshine Coast airport. We happily arrange transfers from this airport (& Brisbane) direct to Heartland. If coming from overseas, North Queensland, WA or Tasmania we recommend guests fly to Brisbane and catch the ultra-modern daily Tilt Train service to Gympie North station or regular Greyhound/McCafferty’s coach service to Gympie where we will pick you up (free service). If coming from Rockhampton/Bundaberg we recommend the Tilt Train. All course prices include meals, workshops, private consults, trips and accommodation. We accept Amex, Visa and Mastercard credit cards & cheques. Bookings are essential and can be made up to 6 months ahead. They can be confirmed with a $200 transferable deposit.